Time: 6 hrs. 30 mins. The Taylor Flats Section of the 118 mile long Paradox trail begins near the Buckeye Reservoir north of the town of Paradox, Colorado and ends east of Moab, Utah along the Moab-Gateway Road where it meets up with the Kokopelli trail that runs from Grand Junction, Colorado to Moab, Utah. When these two trails are combined with the Tabeguache trail they form what is known as the epic 360 mile Grand Loop. The Taylor Flats section begins at the junction of the U5/FR 371 Roads and the Q13/FR 378 Roads near the northwest corner of Buckeye Reservoir. The intersection is 11 miles north of the town of Paradox via Forest Road 378. 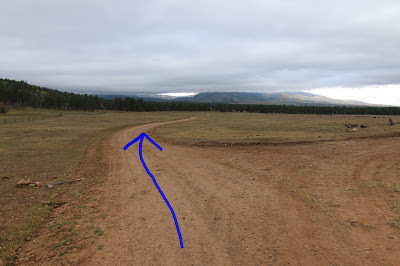 As the Taylor Flats section starts out it only goes a short distance before it leaves the Manti-la Sal National Forest and crosses the state line into Utah. At this point the road becomes San Juan County Road 176. The trail has a mostly uphill trend until it reaches its highest elevation around the 8 mile point from Buckeye Reservoir. The elevation profile shows that the overall elevation gain is only 406 feet from one end of the trail to the other but in between there is 2,986 feet of climbing and 2,579 feet of downhill. The net difference means that you are going to get a heck of a workout no matter which direction you are going. A map can be handy at some of the intersections. There is a trail marker at this one but it looks like the cows have knocked it over. Once a marker gets knocked over it isn't always easy to tell for sure which way it was supposed to be pointing. Near the 5.4 mile point the first major intersection comes up where a road connects on the left that runs back out to Highway 46. It also makes a connection to the La Sal Pass Road. The trail reaches its highest elevation around the 8 mile point and at the 12 mile point it has given back about 800 feet of elevation gain when it reaches Taylor Flats. At this point it begins its next climb as it passes by the Pine Ridge Trust Lands. 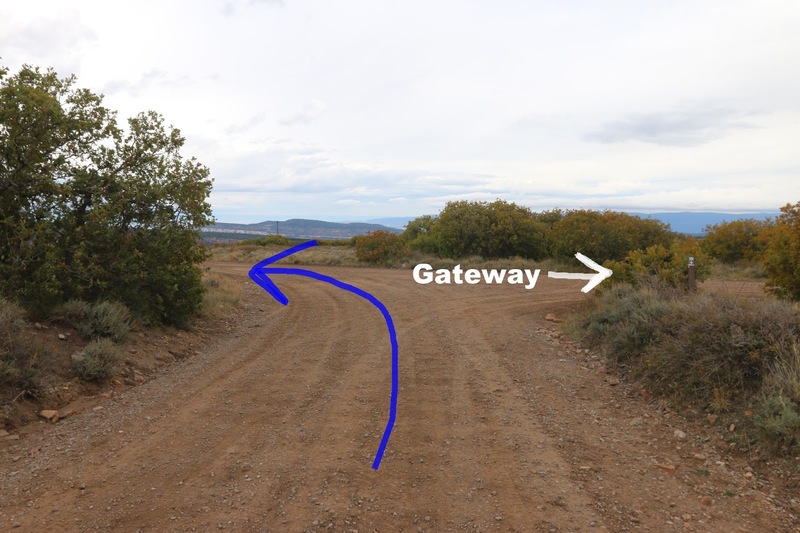 Around the 17.4 mile point the trail reaches the Moab-Gateway Road which it follows to the left. From there the trail descends down into the Beaver Creek drainage only to have to make a 500 foot climb on the other side to get out of it. As the trail climbs out of Beaver Creek it crosses back into the Manti-la Sal National Forest. An early September snow in the La Sals above the 11,000 foot level. 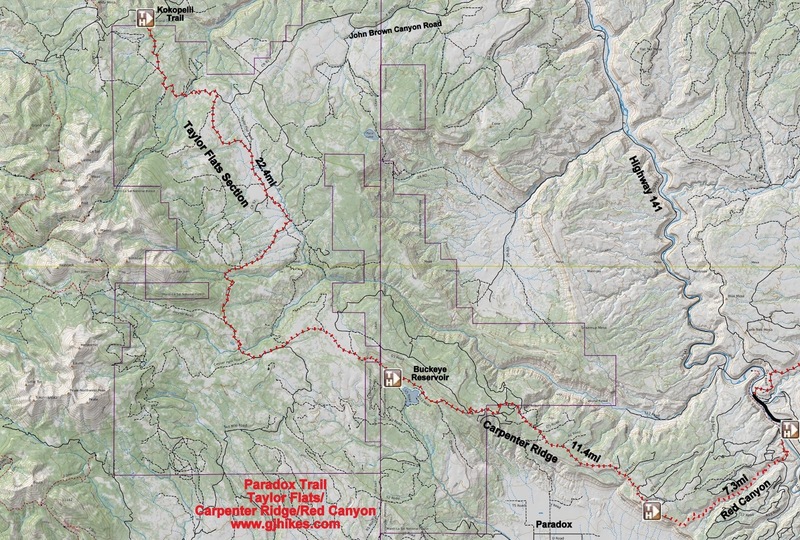 The Taylor Flats Section and the Paradox trail as a whole come to an end at the spot the Kokopelli trail connects to the Moab-Gateway Road. We had been getting sprinkled on for the last mile or so and no sooner had we arrived at the end of the trail when it turned into a torrential downpour. This completes the Paradox trail and the Grand Loop for us although we spent over a year to do all three legs. Our maps might be mediocre but the GPX files should be very accurate. As far as the Taylor Flats Section of the Paradox trail goes if you would like to see it for yourself then all you have to do is grab your bike or 'Take a hike'.